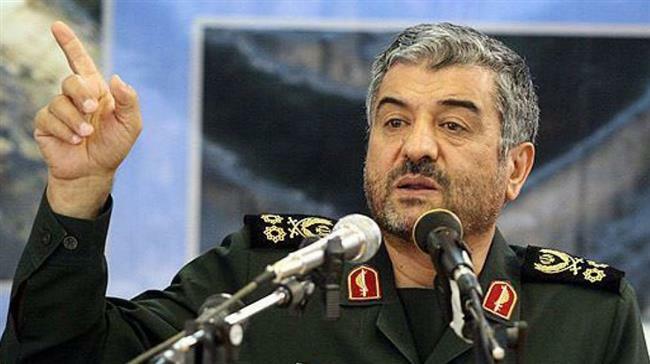 The chief commander of Iran’s Islamic Revolution Guards Corps (IRGC) says the recent retaliatory missile strike against the terrorists based in Iraq’s semi-autonomous Kurdistan region sends a “meaningful” message to the enemies, who imagine they can bully us. “IRGC’s recent revenge against the terrorists conveys a highly meaningful message to the enemies, particularly those superpowers who think they can impose their evil plots us an bully us,” Major General Mohammad Ali Jafari said on Thursday. Thanks to its intelligence and command work and the deployment of precision-guided missiles, Ja’afari said the IRGC managed to target a gathering of terrorists in the Iraqi Kurdistan region in revenge for their deadly attacks on Iranian security forces in Iran’s Kordestan Province. “This capability sent a very decisive message to all enemies,” said the senior general, warning “those who have forces, bases and equipment within a 2,000-kilometer radius around Iran” against any potential attack on the country’s soil. The IRGC on Sunday confirmed that it had fired seven short-range missiles at a gathering of terrorist commanders in Iraq’s semi-autonomous Kurdistan region. Following wicked actions taken by terrorist groups affiliated with the global arrogance from the Kurdistan region against Iran’s border areas in recent months, the IRGC decided to counter and punish the aggressors, the IRGC said in a statement. On Wednesday, Chairman of the Chiefs of Staff of the Iranian Armed Forces Major General Mohammad Baqeri said the US had been provoking Iraq-terrorists over the past year to launch assaults on Iranian soil despite an earlier promise not to do so. The Iranian general said Baghdad and the Kurdistan Regional Government (KRG) should not allow the establishment of such anti-Iran bases and rather extradite the remnants of “criminal” elements to Iran or deport them. Foreign Ministry spokesman Bahram Qassemi also said Iran will not follow a policy of appeasement when it comes to its security issues and the violation of its sovereignty by terrorist elements.